options JSON Object platform specific initialization options. options.android JSON Object Android specific initialization options. options.android.senderID String Maps to the project number in the Google Developer Console. options.android.icon String Optional. The name of a drawable resource to use as the small-icon. options.android.sound Boolean Optional. If true it plays the sound specified in the push data or the default system sound. Default is true. options.android.vibrate Boolean Optional. If true the device vibrates on receipt of notification. Default is true. options.android.clearNotifications Boolean Optional. If true the app clears all pending notifications when it is closed. Default is true. options.ios JSON Object iOS specific initialization options. options.ios.alert Boolean Optional. If true the device shows an alert on receipt of notification. Default is false. options.ios.badge Boolean Optional. If true the device sets the badge number on receipt of notification. Default is false. options.ios.sound Boolean Optional. If true the device plays a sound on receipt of notification. Default is false. options.windows JSON Object Windows specific initialization options. event String Name of the event to listen to. See below for all the event names. callback Function is called when the event is triggered. The event registration will be triggered on each successful registration with the 3rd party push service. data.registrationId String The registration ID provided by the 3rd party remote push service. The event notification will be triggered each time a push notification is received by a 3rd party push service on the device. data.message String The text of the push message sent from the 3rd party service. data.title String The optional title of the push message sent from the 3rd party service. data.count String The number of messages to be displayed in the badge iOS or message count in the notification shade in Android. For windows, it represents the value in the badge notification which could be a number or a status glyph. data.sound String The name of the sound file to be played upon receipt of the notification. data.image String The path of the image file to be displayed in the notification. data.additionalData JSON Object An optional collection of data sent by the 3rd party push service that does not fit in the above properties. The event error will trigger when an internal error occurs and the cache is aborted. The unregister method is used when the application no longer wants to receive push notifications. The count is an integer indicating what number should show up in the badge. Passing 0 will clear the badge. Each notification event contains a data.count value which can be used to set the badge to correct number. into your apps config.xml file. PhoneGap Build will pick up the latest version of phonegap-plugin-push published on npm. If you want to specify a particular version of the plugin you can add the version attribute to the gap tag. This is because Android now uses Material design and the default icon for push will be completely white. Where icon is the name of an image in the Android drawables folder. Writing a hook to describe how to copy an image to the Android drawables folder is out of scope for this README but there is an excellent tutorial that you can copy. iconColor is one of the supported formats #RRGGBB or #AARRGGBB or one of the following names: 'red', 'blue', 'green', 'black', 'white', 'gray', 'cyan', 'magenta', 'yellow', 'lightgray', 'darkgray', 'grey', 'lightgrey', 'darkgrey', 'aqua', 'fuchsia', 'lime', 'maroon', 'navy', 'olive', 'purple', 'silver', 'teal'. Please follow the Android icon design guidelines when creating your icon. Additionally, each push can include a large icon which is used to personalize each push. The location of the image may one of three types. Would look for the twitter image in the drawables folder and produce the following notification. Would look for the logo.png file in the assets/www/img folder. Since your apps www folder gets copied into the Android assets folder it is an excellent spot to store the images without needing to write a hook to copy them to the drawables folder. It produces the following notification. Note: when you specify the custom sound file name omit the file's extension. By default when using this plugin on Android each notification that your app receives will replace the previous notification in the shade. You will only see both "Push number 1" and "Push number 2" in the shade. summaryText: "There are %n% notifications"
You will get an inbox view so you can display multiple notifications in a single panel. If you use %n% in the summaryText of the JSON coming down from GCM it will be replaced by the number of messages that are currently in the queue. Perhaps you want to include a large picture in the notification that you are sending to your users. Luckily you can do that too buy sending the following JSON from GCM. 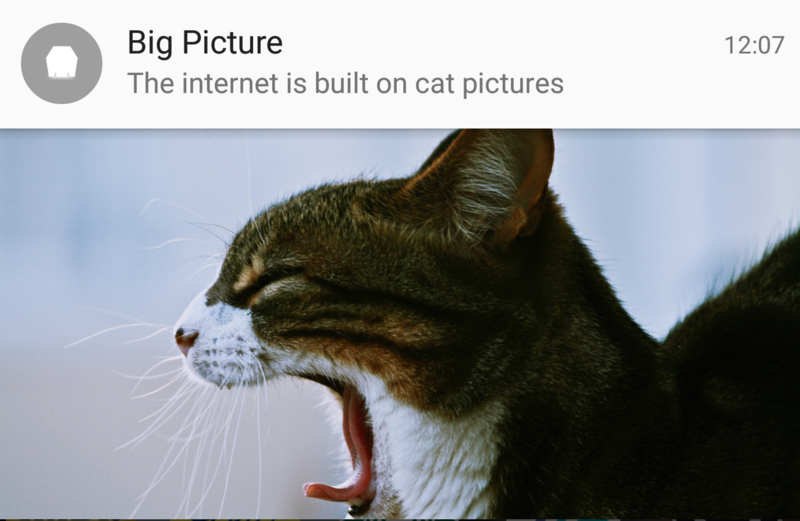 summaryText: "The internet is built on cat pictures"
In order for your your notification to play a custom sound you will need to add the files to root of your iOS project. The files must be in the proper format. See the Local and Remote Notification Programming Guide for more info on proper file formats and how to convert existing sound files. The plugin supports all types of windows platform notifications namely Tile, Toast, Badge and Raw. The API supports the basic cases of the notification templates with title corresponding to the first text element and message corresponding to the second if title is present else the first one. The image corresponds to the first image element of the notification xml. The count is present only for the badge notification in which it represent the value of the notification which could be a number from 0-99 or a status glyph. For advanced templates and usage, the notification object is included in data.additionalData.pushNotificationReceivedEventArgs. This plugin automatically sets the toast capable flag to be true for Cordova 5.1.1+. For lower versions, you must declare that it is Toast Capable in your app's manifest file. There should be no dependency on any other plugins. All platforms should use the same API! The project uses .editorconfig to define the coding style of each file. We recommend that you install the Editor Config extension for your preferred IDE.